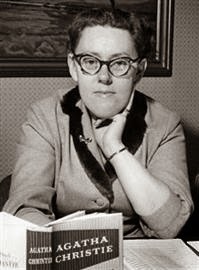 Maria Lang (pseudonym for Dagmar Maria Lange) published her first murder mystery in 1949 and continued to bring out one a year for 42 more years, plus some "deckare," as the Swedish call mystery novels, for children. She was definitely influenced by the British crime genre, and was repeatedly called "the Swedish Agatha Christie," though she also makes references to Lord Peter Wimsey in her books. She was definitely in the cozy branch of the genre, and reportedly clashed with Per Wahlöö in a meeting of the Swedish society of crime novelists, and quit the organization over the direction in which the genre was heading. There's a Swedish 6-part TV series that was made from some of the novels, which is being shown now on the U.S. MhZ World View network. I looked for some of the novels, to compare them with the series, and was only able to find one in English translation (Kung liljeconvalje av Dungen, literally King Lily of the Valley of the Shady Grove, a phrase from the Swedish poet Fröding), under the title A Wreath for the Bride. A couple of the others are promised in translation in Kindle versions for later in the spring. In the TV series, the primary investigators are Chief Inspector Christer Wick and his friend Puck Ekstedt, along with Puck's love interest and later husband Einar Bure, called Eje. There's an intersting triangular sexual tension among them throughout the series, and Puck (an unusual name for a Swedish woman, I would have thought, but the name is never explained) is an aspiring academic for wom murders are only an abiding interest rather than a profession (as in the purely "amateur detective" genre, bodies are constantly appearing in her presence, and always in the vicinity of the small town of Skoga, where Eje and Christer are from, rather than in Stockholm, where all of them now live). The TV writers have preserved the atmosphere of the book A Wreath for the Bride, without sticking too closely to the actual plot or language. In fact, Puck is absent in this text, referred to only in passing by Christer, who wishes she were nearby to offer her help. but Christer himself is very recognizable, though his literary pipe is replaced on film by cigarettes, and tobacco is ubiquitous in both. The books are quite naturally a bit dated now, but offer an interesting glimpse into pre-noir Swedish crime fiction and culture. The translation is also a bit of its day, though Joan Tate is quite well known for her work as a translator. 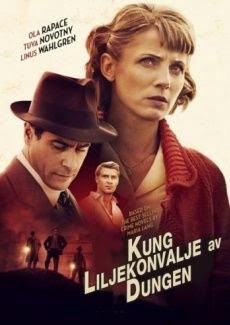 But Lang could certainly be said to be the founder of Scandinavian crime fiction, and her work is a vivid contrast to Wahlöö and the others who would follow--both the TV series and the arrival of new books (in Swedish, as Norstedts is bringing back some of the novels in new editions, and in English, assuming those e-books do materialize soon, are very welcome additions to our bookshelf of far-nothern crime. This sounds very interesting. I wonder if it will be shown on a main British channel?